The title of the show is not wholly unique. It borrows from the title of a 1981 Rosalind Krauss text, which questions the avant garde’s attachment tonotions of authenticity and its denial of its own foundation in processes of repetition. The terms of the production and reception of art have shifted since the writing of that text, through both the foregrounding of appropriation as a critical art practice and the rise of sampling at all levels of cultural production. Appropriation and repetition have become central to the way art and ideas circulate, and yet the cult of originality as described by Krauss still overwhelmingly defines our valuation of the contemporary in art. Through a series of doublings and transpositions, the exhibition investigates the potential of repetition as a model for generating meaning. 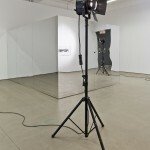 Photographs, film, reflection, projection, the space of the studio and the space of the gallery are superimposed one upon the other in a proliferation of analogues that take for subject their own state of interconnection. 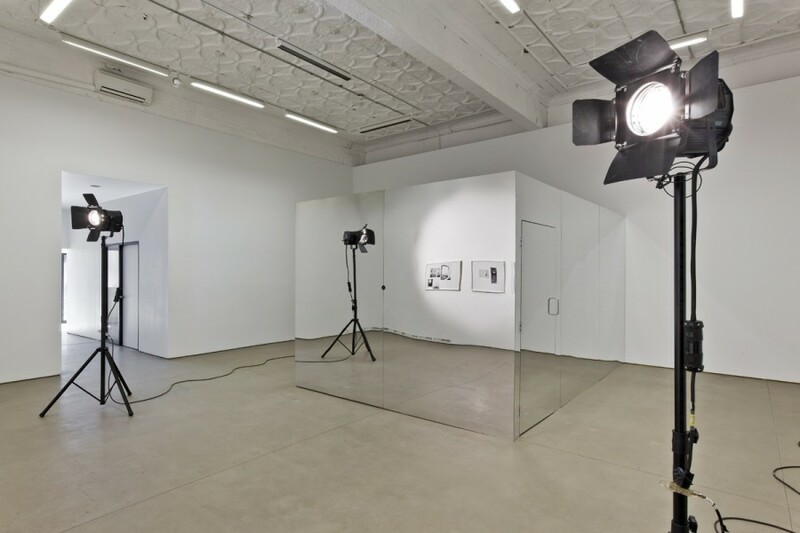 Annie MacDonell is a visual artist whose practice includes film, photography, sculpture, installation and sound. Her work deals with exhausted ideas and images, and the conventions of display as they exist in relation to art and the space of the gallery. She earned a BFA from Ryerson’s School of Image Arts, in Toronto and an MFA from Le Fresnoy, in Tourcoing, France. She has shown work and screened films internationally. Currently, she teaches in the photography department at Ryerson University. Joan Lillian Wilson: How extensive was the production process of this work and was creating a camera obscura as challenging as it seems? Annie MacDonell: No, that actually wasn’t the most complicated part, because it’s such a basic technology. It was just about getting the right lenses for the focal length. It was complicated in that the focal length for that camera obscura is much longer than a typical focal length. Usually, focal lengths are measured in inches or fractions of inches, and here it was fourteen feet. But once I found the right lens combination, it was fine. JLW: I was excited to actually be able to go in one because I’ve read so much about them learning the history of photography. AM: Well, I think normally they work differently than this one. The usual model would have the lens look out onto an exterior scene, so the image would be brighter. But I don’t mind the dimness of this particular image. 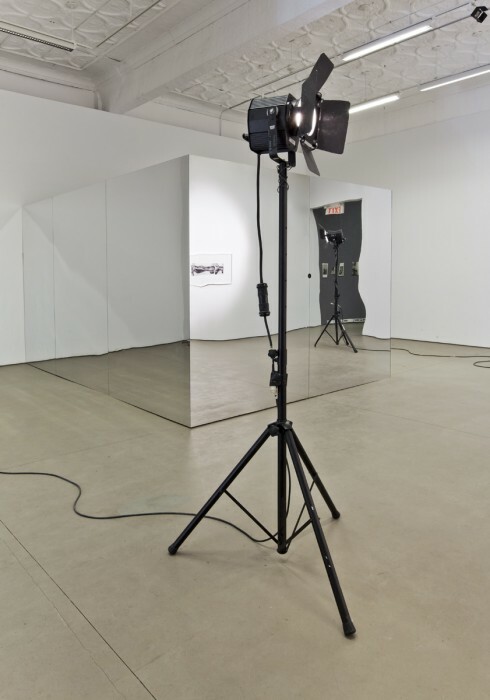 It marks a strong distinction between the video image and the proto-photographic technology of the camera obscura. It highlights the distance that we’ve come in terms of reproducing images. 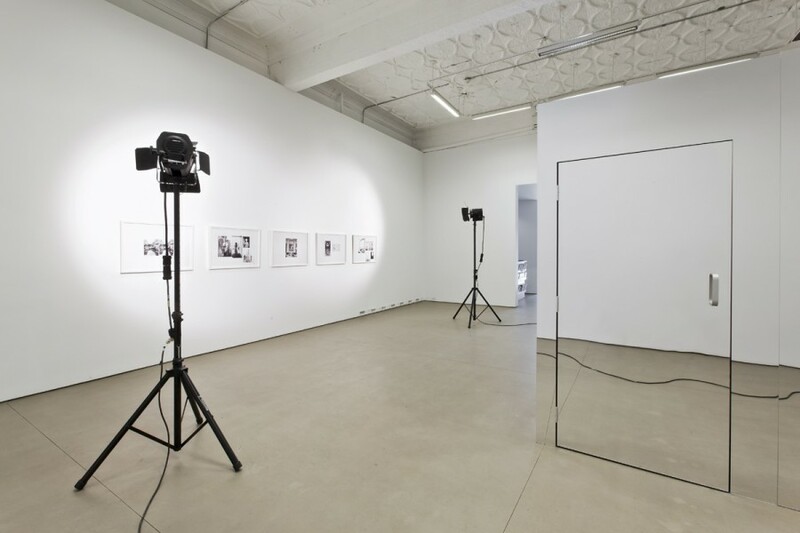 JLW: The photographs on the gallery wall are the first element the viewer interacts with when entering the installation, what is the significance of your selection and grouping of the archival images? 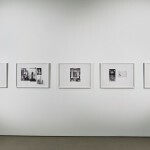 AM: The images come from the Picture Collection at the Toronto Reference Library, which is a resource that has been used by artists in the city for a long time. It’s something that I often access at the beginning of a project, to help me clarify my thinking around certain kinds of images. The appeal of the Picture Collection is that it’s a very idiosyncratic collection that has been put together by the library over the course of the years. It’s not at all as efficient as a Google search, but its charm is that it doesn’t come from an algorithm that generates the images closest to your search term. What you find in a folder depends on what kinds of images the librarians have been clipping throughout the years. The images come from such a wide range of sources, from fine art magazines, to calendars, to postcards and all different kinds of printed material. For this project there were two folders that I was pulling from; the Reflections folder and the Mirrors folder. All the images in these folders were of either doubled or reflected imagery. I was thinking about what happens when you have an image within an image, and about how as soon as you shoot a reflected image, you are already talking about the process of image-making itself. JLW: Although the photographs are framed, when viewing the images it almost seems as though your studio wall has been transported into the gallery. What is the relationship between the two spaces and why was it important to maintain this reference within the work? 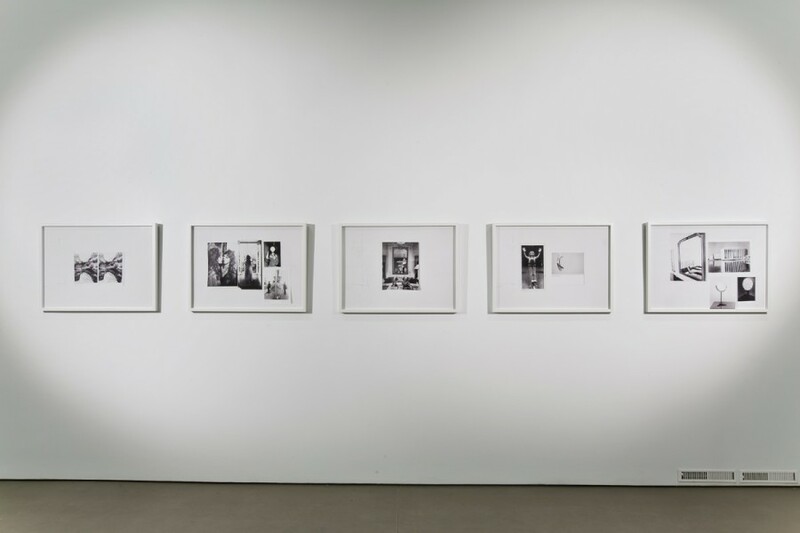 AM: I made the photos by grouping the Picture Collection images in configurations on my studio wall, and shooting them with the wall as a backdrop, with all its existing marks and scars. The presence of the wall works for me on a few different levels. A big part of the project was an interrogation of my own way of making work, but it was also about formulating questions around what it means to be making work after the 20th century. Many of these questions were about the way we make images, but they were also about the way that images are distributed. I wanted to have both the space of production, which for an artist is the studio space, as well as the space of display, or exhibition. Within the exhibition I’m exchanging, or superimposing the two onto one another in a number of different ways. The presence of the studio wall within the photographs is, like you said, a part of it. But the superimposition is repeated in the camera obscura structure, which is built to the exact size of my studio space. 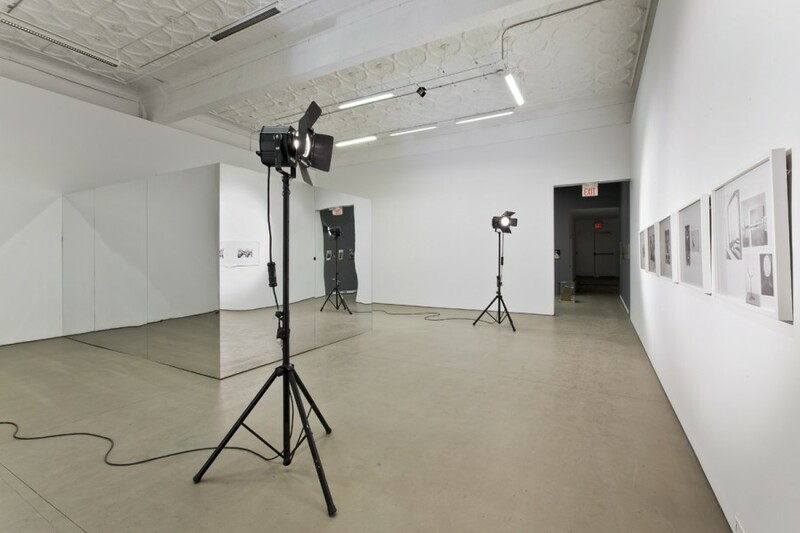 Both the film projected within the camera obscura and the photos were shot in that same studio space. So, the gallery wall and the studio wall are exchanged one for the other, a few times over in the show. JLW: The camera obscura was used centuries ago for science as well as to trace scenes for painting, and it eventually aided in the actual invention of photography. Is this reference to photography’s invention and its ability to distribute mass amounts of images relevant in your work? AM: Yes, it’s definitely work that is about photography and the way that photography has shaped the way that we understand art in general. I find that people often discount the importance of photography in the way that modernism progressed over the course of the 20th century. The conversation that began around the photograph and its relationship to fine art was then expanded out to open up possibilities around all sorts of other media and subjects. Getting photography into the gallery and the museum was like the opening of a floodgate; it led to a redefinition of what constitutes art in general. 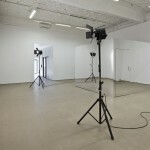 But there are a number of other photographic devices which become central to the way we make and think about art. Framing for instance, as a means of relating to the real world: in photography it’s only by this magical process of framing a scene in the viewfinder that you turn it into “art”. This drive to reframe the real world is something we do a lot in contemporary art as well. But instead of using the photo frame, we use the gallery. You can take something from the real world, and as soon as you bring it into the gallery the conversation around it entirely shifts. That act of gesture of framing is something that for me is rooted in photography as well. Another example would be the idea of the caption. The fictional character who speaks to the camera in the film is named “The Caption”, which is a reference to something Walter Benjamin said at the very beginning of the 20th century. He said that before photography there was no such thing as the caption, photography invented the caption. Benjamin goes on to propose that over the course of the century, the caption would become the most important part of the image. I think this is true not only of the way that we make photographs, but the way we make art in general now. In many cases, it’s the way that you discuss the work, the way you title it and present it, that really activates it. 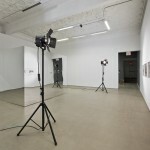 JLW: The camera obscura re-presents the photographs on the gallery wall. It is a projection of the re-photographed images which were copied from copies of the originals. 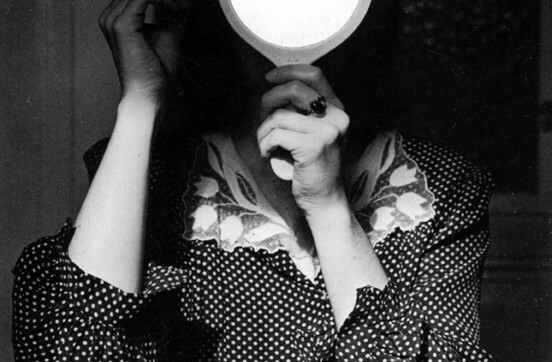 There are many layers between the viewer and the original archival photographs. Is this meant to speak to the title of the work and the concept of originality? AM: Of course, and also to the idea that those original photographs aren’t originals either. A photograph is just one iteration in a potentially endless chain that includes the negative and the multiple copies that can come from that negative. It’s hard to say if there is such thing as an original photograph. That’s a question that photo conservationists and curators are always trying to figure out; what counts as the original in photography? Is it the negative, or the image that’s printed closest to the date that the negative was produced, or is it only the prints made by the artist? It’s one of the fundamental problems of photography, and it’s also a useful jumping off point for a bigger conversation about originality and its place in art. 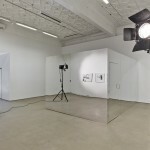 JLW: When inside the camera obscura structure, the viewer is shown a rotation between the video projection and the natural projection of the gallery wall through the pinhole, what is the relationship between the two projections? 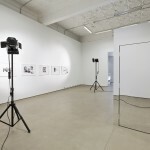 AM: There is the aspect which I mentioned earlier, where both of the projections present a contrast between two forms of photography separated by years of innovation. But, more importantly, the show is organized as a series of doublings within the still images, the film and the space itself. 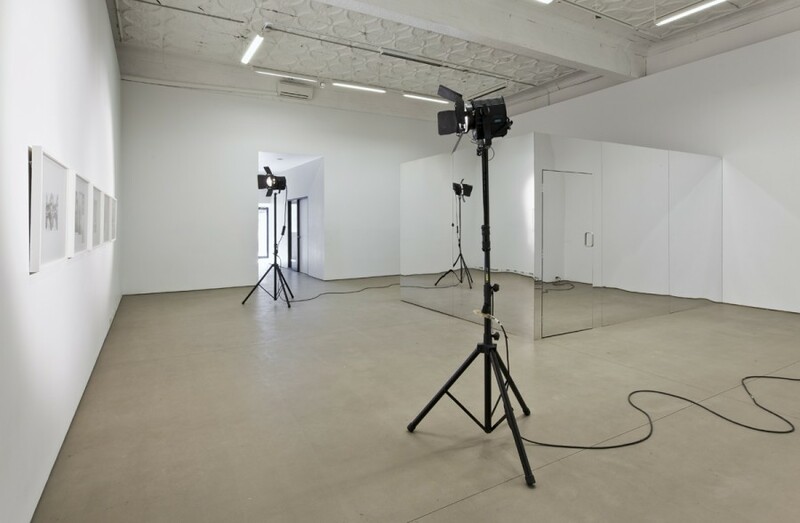 The double projection is a way to provide one final act of doubling, by bringing the space of the exterior exhibition into the interior projection space, once again superimposing the space of exhibition onto the space of production. The outer gallery wall is aligned with the studio wall, provided by the projection space, which is the double for my studio. JLW: Looking at the concept of originality itself, I think about something I was constantly told in art school: you can’t produce work in a vacuum, you have to be aware of what other artists have done and are doing because someone probably already had a similar idea to yours. Does your work echo this in any way? AM: Well, I agree that you can’t make work in a vacuum. If you make something that is similar to work that has already been made, then it shouldn’t be a straight reiteration. But you can make things that are in conversation with things that already exist. That’s part of the appeal of making art, after all; you get to become active in a conversation that spans so many years, so many different mediums, and so many different artists. I make specific reference to other works in this exhibition, but the goal is to not simply reference them, but rather to engage them in a dialogue. My whole interest in formulating these questions around originality and the Avant Garde stems from re-reading a Rosalind Krauss essay. Her position is that the drive towards constant and absolute renewal within every new art movement was an urge that was specific to Modernism. But even if you dig under the surface of all the mini revolutions that Modernism offered up, you find that sometimes the originality does not go much deeper than the very surface of the thing. And this idea that is still hanging around all these years later, that to make relevant work it has to be completely new and fresh. It has to obliterate everything that came before it. But I don’t think that’s the most productive way of thinking about art and ideas. JLW: Speaking of modernism and the fact that postmodernism was very critical of the concept of a completely unique, original idea; artists such as Sherrie Levine who re-photographed other artist’s work and presented it as her own questioned this idea of authorship and originality. What is the significance within your own work of using photographs taken by other people? AM: Part of what I am trying to do with this work is to create an image with no specific point of origin. I started out with images that already existed, and then set up relationships within the exhibition that continued the doubling and refraction inherent to photography. In that way it is related to a Levine-like gesture of appropriation. But appropriation has always seemed to me the most direct way to decenter the subject and enlarge the conversation; the person, or the landscape, or the still life in the image is no longer central to the work. The work becomes about representation itself, which has always seemed to me a more interesting conversation. As soon as you step away from that really simplified, typical version of the original artistic act, then you can begin to access all the different signifying layers and social complications that collect around images. An original gesture doesn’t have to mean that you are the first person to produce the image. It can also be about the ways that you activate existing images, or place those images into contact with other things in order to animate them differently. That’s also the proposition of the film – that there is creative potential within repetition. JLW: There are certain ideas that automatically happen around the use of found images. Craig Owens noted that Levine’s work may be “…dramatizing the diminished possibilities for creativity in an image-saturated culture…” Does your work speak to this at all? AM: I know that is sometimes the conversation that happens around appropriating images, but that’s not necessarily the way that I think about it. Appropriation is not a defeatist gesture for me. I don’t feel that every image has already been made and there are no more new images to be produced. That’s impossible. I just find myself more interested in excavating all the layers of meaning that accumulate around images when they’ve been hanging around in the world for a while. It’s more exciting for me to make images out of images that already exist, in the same way that it’s exciting for me to make work that is in conversation with work that already exists. JLW: What kind of work can we expect to see in the future? AM: I do want to finish working through the ideas and questions that are at the center of this show. As I said, the works here were meant as an interrogation. I don’t really know where it’s going to end up. But with this first part I’ve laid out a groundwork. The next chapter will be at the AGO in the Toronto Now space in April. I’ve shot another film, which is a follow up to the one presented here. Parts of that will be presented in the spring show. But ultimately my intention is to keep shooting the film in bits and parts, working through the questions progressively and eventually assembling it all into a single feature-length film for cinema presentation. Joan Lillian Wilson is a Toronto-based artist and writer. She recently graduated from OCAD University where she studied Photography and Art History. Currently, she is an intern at Mercer Union.